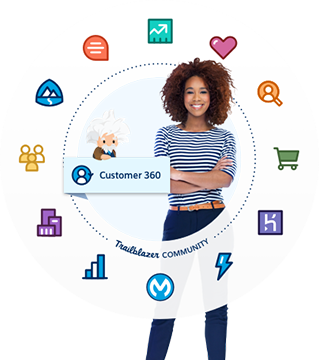 The world’s #1 CRM solution for every part of your business. Connect with your customers across sales, customer service, marketing, communities, apps, analytics, and more with Salesforce Customer Success Platform. With the Salesforce cloud-computing model, our CRM solutions can customised and scaled quickly to the meet needs of small, medium and enterprise-sized businesses as they grow. With Sales Cloud, you can grow your accounts, find new customers, and close deals faster — from anywhere. The path to success starts here. Get more leads and make them sales-ready. Nurture leads so they’re ready to convert, then automatically route them to the right reps at the right time. Build your own "lead machine" to improve conversion rates and grow your revenue. Accelerate sales productivity with a lightning fast console. Whether you’re a rep in the field or you prefer to work inside your email inbox, now you can do more with AI, automatic data capture, and business process automation. All in one console. Make insightful decisions with up-to-date data. With Salesforce, information is in one place so it’s easier to prioritise and make quick decisions based on the most up-to-date information. And do it all from any device. Give reps the power of automation and artificial intelligence. Make CRM data work harder for reps. Sales Cloud Einstein is artificial intelligence that learns what separates deals won from deals lost, and highlights top leads and next steps. Support customers everywhere with the service platform that keeps the conversation flowing. Close cases faster with the help of AI and automation. Help your support agents solve customer problems faster by putting the right tools at their fingertips — all from one console. Provide faster, more intelligent self-service. Build self-service communities. Give your customers access to the answers they need to solve problems on their own terms and timeline. Personalise customer care and predict needs. Get more insight into your customers’ behaviour so you can personalise their service, predict future needs, and even provide conversational service with live messaging. Drive service productivity from the call center to the field. Improve your mobile service operations and deliver connected, intelligent, more personalised service from the phone to the field on one platform. Make the most of every customer interaction by creating personalised, cross-channel customer journeys that deliver exceptional experiences across email, mobile, social, advertising, the web, and more. Build and manage personalised customer journeys with Marketing Cloud. Discover the complete solution to navigate the entire customer journey — on one platform. Explore the gear to help marketers deliver the right message at the right time — on any channel. Personalise your email marketing at scale. Build and manage any kind of email campaign. Use CRM and other data for personalisation that drives engagement. Automate your marketing to scale your capabilities and reach customers with relevant messaging. Use SMS, MMS, push notifications, and group messaging to reach customers anytime, anywhere. Go cross-channel and extend your digital marketing strategy by adding mobile to your email and social campaigns. Create 1-to-1 customer journeys across email, mobile, social, ads, and the web. Connect experiences across marketing, sales, service, and every customer touchpoint. Connect social to marketing, sales, and service with social media marketing tools. Listen, engage, publish, and analyse data from over a billion sources while automating social workflow. Small Business Solutions – grow your business at every step. the right customers by personalising every interaction. every customer by selling faster anywhere. customers happy by servicing on any channel. everything you do by running your business on one platform. Powerful customisation. Salesforce Australia's Customer Relationship Management (CRM) technology supports any sales process in all sectors and geographical regions. High user adoption. Sales reps, managers and executives use our custom CRM software to increase customer satisfaction, grow revenues, and reduce expenses. The award-winning results are so swift, effective and user-friendly that they never turn back. Instant adaptability. Point-and-click customisation for our CRM Software solutions matches how you sell precisely and instantly. Smart n' speedy. Instant analytics enable your business to make deeply informed decisions on the spot. Quick and safe global expansion. Global deployment of CRM solutions for online, offline, and mobile use is immediate - which creates widespread adoption and frees your business from the hidden costs and unacceptable risks of lengthy old-school implementations. Salesforce is the world’s leading provider of CRM solutions. Our CRM products include cloud-based solutions and apps for sales, service, marketing, collaboration, analytics, and building custom apps and mobile apps. With the Salesforce cloud-computing model, our CRM solutions can instantly scale and be customised to the needs of small businesses, medium businesses and enterprises as they grow and change. Saleforce CRM solutions will save your company time and money by automating tasks that can keep your people from focusing on customers and big picture initiatives. And because Salesforce CRM products work in the cloud, they eliminate the need for costly on-premise IT staff, costly repairs, downtime and software upgrades. But our products are also designed to integrate seamlessly with legacy on-premise systems so you can make the switch to the cloud at the pace that works best for your company. Our Custom CRM Software Products help your sales teams to soar! Flagship Sales solution, CRM SFA includes these features - designed to keep your revenue growing. A complete view of your customers: shared in real time with your support and marketing teams, allowing them to keep on track and close more deals. The reps love it. With fast, easy access online, offline, or via mobile devices, integration with popular tools like Microsoft Office and Microsoft Outlook and an easy user interface, Salesforce Australia's CRM software lets your reps spend more time selling and less time on admin. The manager love it. Thanks to effective opportunity management, forecasting, and limitless customisation capabilities, sales managers can be confident that they are keeping track of their sales reps' pipelines and capitalising on their potential. The executives trust it. Executives need to practice the art of the deal armed with the right answers and data. Custom CRM solutions from Salesforce Australia offer unique customisable analytics and invaluable access to the big, medium and small picture with a single click. Salesforce Australia's Custom CRM Software makes your data work smarter to increase sales. Lead Management. CRM solutions allow you to track enquiries about prospects and seamlessly direct qualified business leads to the right people. Approvals and Workflow. Salesforce Australia's custom CRM software equips your business with automation capabilities tailored to your organisation's unique needs, editing out redundant tasks that don't adhere to your processes. Sales Forecasting and Pipeline. Precise and punctual forecasts of sales funnels, revenue and customer demand allow your business to align expenses with revenue growth. Easily Customised Reports and Dashboards. Sales managers and executives can consolidate the immediate and real-time sales data that they need only. Sales Content Management. With Salesforce.com's custom CRM software, your reps can always access the materials they need to close deals faster through features like tagging, rating and subscription. Mobile. Sales reps can be even more productive and mobile with instant access to customer data via BlackBerry , iPhone, or Windows Mobile devices. Analytics Business intelligence software to explore data, get instant answers, and collaborate with your team.